Danish researchers at University of Copenhagen lead the way for future monitoring of marine biodiversity and resources by using DNA traces in seawater samples to keep track of fish and whales in the oceans. A half litre of seawater can contain evidence of local fish and whale faunas and combat traditional fishing methods. Their results are now published in the international scientific journal PLOS ONE. whales in the water. Photo: Jos Kielgast. "The new DNA-method means that we can keep better track of life beneath the surface of the oceans around the world, and better monitor and protect ocean biodiversity and resources," says PhD student Philip Francis Thomsen from the Centre for GeoGenetics, Natural History Museum of Denmark, University of Copenhagen. Marine ecosystems worldwide are under threat with many fish species and populations suffering from human over-exploitation, which greatly impacts global biodiversity, economy and human health. Today, marine fish are largely surveyed using selective and invasive methods mostly limited to commercial species, and restricted to areas with favourable conditions. However, researchers at Centre for GeoGenetics now lead the way for future monitoring of marine biodiversity. They have shown that seawater contains DNA from animals such as fish and whales. The species leave behind a trace of DNA that reveals their presence in the ocean based on water samples of just half a litre. The development of the novel DNA monitoring approach was accomplished by PhD student Philip Francis Thomsen and Master’s student Jos Kielgast from the Centre for GeoGenetics headed by Professor Eske Willerslev. In December last year, they showed that small freshwater samples contain DNA from several different threatened animals, and after having published these results they began to focus on seawater. Here it also proved possible to obtain DNA directly from the water, which originated from local species living in the area. "We analysed seawater samples specifically for fish DNA and we were very surprised when the results started to show up on the screen. We ended up with DNA from 15 different fish species in water samples of just a half litre. We found DNA from both small and large fish, as well as both common species and rare guests. Cod, herring, eel, plaice, pilchard and many more have all left a DNA trace in the seawater," says Philip Francis Thomsen. In the other study the researchers showed that it is also possible to obtain DNA from harbour porpoise in small water samples taken in the sea, so the approach is not only limited to fish, but can also track large marine mammals. The study also compares the new DNA method with existing methods traditionally used for monitoring fish such as trawl and pots. Here, the DNA method proved as good as or mostly better than existing methods. Moreover, the DNA method has a big advantage that it can be performed virtually anywhere without impacting the local habitat – it just requires a sample of water. 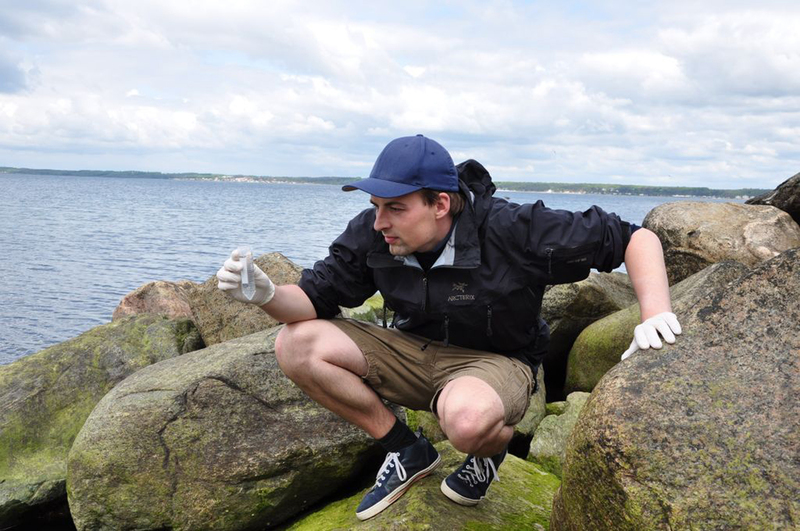 Associate Professor and fish expert Peter Rask Møller from the National History Museum of Denmark, who also participated in the study, is optimistic. "The new DNA method has very interesting perspectives for monitoring marine fish. We always keep our eyes open for new methods to describe marine fish biodiversity in an efficient and standardised way. Here, I look very much forward to follow the DNA method in the future, and I think it could be very useful to employ in oceans around the world," says Peter Rask Møller. The researchers also see great perspectives in the method for estimating fish stocks in the future. Click here to download press photos in full resolution.